Stony Brook Men’s Basketball picked up two key victories this week, winning 97-61 against the Molloy College Lions in the team’s home opener at Island Federal Credit Union Arena on Wednesday, Nov. 21 and against Rhode Island on Nov. 24. Redshirt-junior forward Andrew Garcia led the Seawolves with his first career double-double coming off the bench against Molloy, notching career highs in points with 20 and rebounds with 10 in 22 minutes on the court. Garcia shot perfectly from the field in the first half and ended the game shooting 60 percent from the field, 50 percent from three and 75 percent from the charity stripe. After dealing with serious knee injuries for two and a half years, Garcia talked about his return as well as his performance. Tying Garcia for the team lead in points and rebounds was starting redshirt-junior forward Akwasi Yeboah. Yeboah notched a double-double with 20 points and 10 rebounds as well, tying his career-high with his second double-double this season. Yeboah shot 40 percent from the field and a team-high 87 percent from the line. In addition to the clutch performances by Garcia and Yeboah, freshman guards Jules Moor and Miles Latimer added 10 and 14 points respectively in their first game at the Island Federal Credit Union Arena, and sophomore guard Elijah Olaniyi contributed eight rebounds. Head coach Jeff Boals was pleased with his team’s performance. Heading into the matchup, the Seawolves were focused on shutting out a potential scoring threat in Molloy junior guard Nick Corbett. Corbett finished the matchup with 13 points and four assists, as well as four turnovers forced by the Seawolves defense. Stony Brook struggled with keeping the momentum rolling at Rhode Island as the game opened up. The Rams took an early advantage and pulled away from a back-and-forth contest with a 7-2 run to take the lead by four. However, the team’s resilient effort, which has been a running theme this year, contributed to the Seawolves’ explosive 16-3 run which began with 8:26 left in the first half. The run gave Stony Brook a 35-30 lead at the end of the first half. Moor started his first game for the Seawolves, accumulating three points, five steals and three rebounds in the matchup. Stony Brook went into the locker room with an edge offensively, nailing two more 3-pointers than Rhode Island and shooting over 50 percent from the field. Rhode Island shot just 35 percent from the field in the half. The Seawolves opened the half pushing their lead to nine with just under 14 minutes remaining in regulation. The Rams’ shooting continued to bottle, as the team attempted 10 more 3-pointers and only nailed one. This was a key factor in the team’s defeat, as the Rams finished the matchup shooting just 8 percent from beyond the arc and 35 percent from the field. Sophomore guard Jordan McKenzie became a key player in the later part of the game. 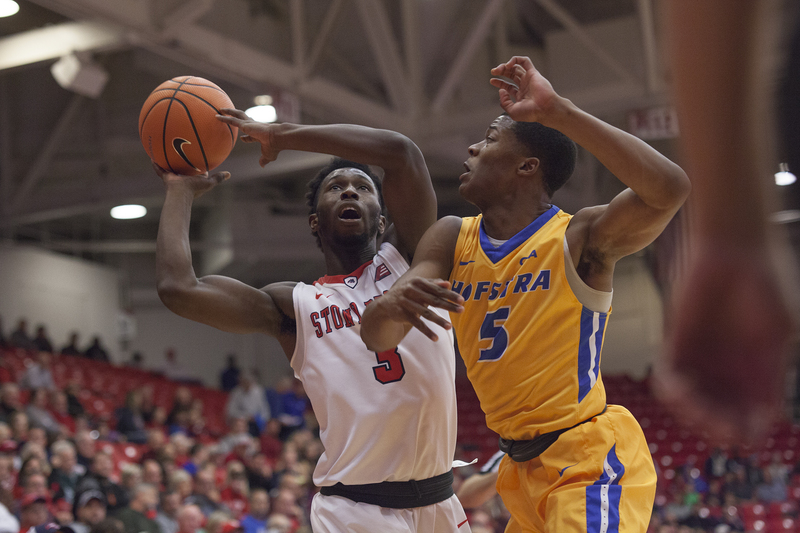 His seven points and two steals in the half helped propel Stony Brook to its fifth victory of the season. McKenzie’s layup with five minutes remaining gave the team a 15-point lead. Rhode Island got the lead down to 67-58 with 33 seconds left, but time ran out on the attempted comeback. Boals was pleased in his team’s mental toughness and performance following its second victory of the week. The team’s next matchup comes against Norfolk State, a team they defeated at the Naismith Basketball Hall of Fame Tournament on Nov. 17. The game will take place on Tuesday, Nov. 27 at 7 p.m.